Europe's crisis is not over yet and unemployment will stay at record levels above 12% until 2015, the European Union said Tuesday. 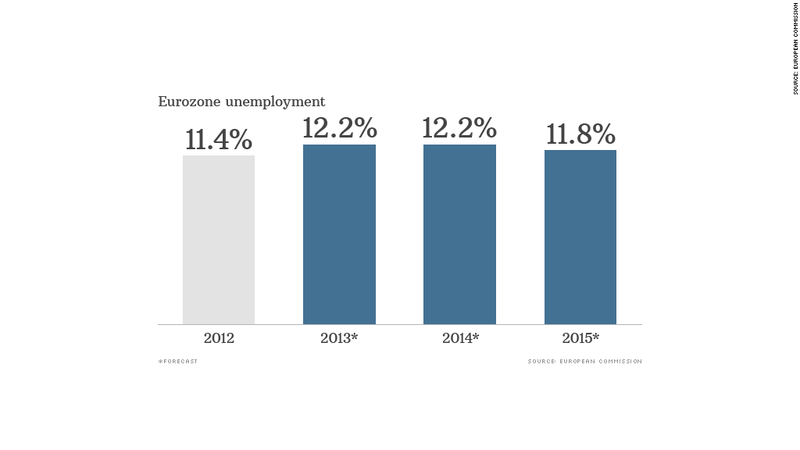 The eurozone emerged from a recession lasting six quarters earlier this year but has struggled to gain momentum since. The culprits: weak domestic demand and a more challenging environment for exporters. Gross domestic product across the 17-nation region will shrink by 0.4% in 2013, after contracting by 0.6% in 2012. "The recovery is expected to continue, and to gather some speed next year. However, it is too early to declare the crisis over," the European Commission said in its semi-annual economic forecast. "External demand is expected to pick up over the coming quarters, but less than earlier expected, on account of a weakened outlook for growth in emerging market economies and the appreciation of the euro." The euro hit a two-year high against the dollar last week. The Commission trimmed its eurozone GDP growth forecast for 2014 to 1.1%, from 1.2% earlier this year. The impact of harsh austerity measures in 2011 and 2012 has begun to fade this year, and eurozone government spending will rise in 2014, but paying down debt remains a priority for companies and households. That means less money available for investment and spending, so any recovery in domestic demand will be very gradual. Lending to companies continues to contract, providing another obstacle to faster growth. "We cannot yet declare victory, and must not fall into the trap of complacency," Olli Rehn, the EU's top finance official, told reporters. Governments must stay the course of economic reform to boost growth and create jobs, he said. Economists have called recently for the European Central Bank to cut interest rates to a new record low -- as early as this week but by December at the latest -- to reduce the risks of a Japan-style period of deflation and stagnation. Deflation is a broad decline in the price of goods and services. It can tip economies into a downward spiral as consumers and businesses delay purchases in anticipation of further falls to come. It also increases the value of debt, a big risk for the eurozone where government debt is expected to hit 96% of GDP next year. Rehn said the risk of deflation seemed "remote" but noted ECB President Mario Draghi's repeated commitment to act if necessary to support the recovery. Apart from making the right call on monetary policy, Draghi is under enormous pressure to restore credibility in Europe's banking industry with a 12-month health check of the region's biggest lenders. The ECB is due to assume responsibility for supervising Europe's top banks late next year, a first step toward a banking union that policymakers say is essential to repairing the damage created by the 2008 financial crisis. Previous rounds of stress tests, including one in 2010, failed to identify major weaknesses among some banks in countries including Spain and Ireland. Rehn said he believed the checks led by the ECB would be much more rigorous. "Mario Draghi has a very strong incentive not to receive any crap in his hands," he said.